To understand the role of glia in brain function, specific manipulation of glial cell activity is required. 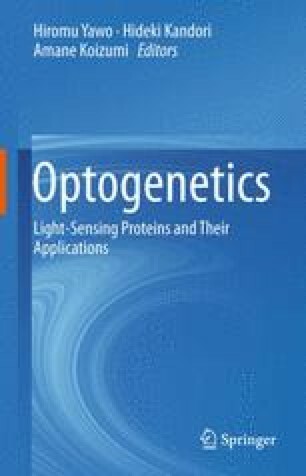 Optogenetics was originally introduced as a tool that can manipulate cell membrane potential with light illumination, and its use was mostly limited to neuronal activity manipulation. Depolarization or hyperpolarization by itself did not seem likely to have much effect on glial cell function as these cells largely lack voltage-gated ion channels. A mostly unrecognized fact is that the main cation that crosses the plasma membrane upon light activation of channelrhodopsin-2 or archaerhodopsin is proton. Thus, these optogenetic tools can be regarded as tools that can manipulate intracellular pH. Not only Ca2+ but also H+, Na+ and other intracellular ionic concentrations can dynamically change upon cell activity and can have a profound effect on cell function. Presented here is a study that shows that glutamate release from glia is triggered by intracellular acidification. The released glutamate from glia can have a profound effect on higher-ordered brain functions such as learning and behavior. It is also shown that rampant glial cell activity occurs upon pathological conditions, such as ischemia, and extreme intracellular glial acidification leads to excess glial glutamate release and excitotoxicity. Optogenetics will likely become an essential tool to study the function of cells previously categorized as ‘non-excitable’ cells such as the glia.